Setting up Taxes in ProfitBooks is easy. Just to go Accounting menu and click on Taxes. Mention effective date of the tax in ‘Start Date’ field. This tax will start appearing only after the effective date. Specify whether this tax is applicable on sales or purchases. 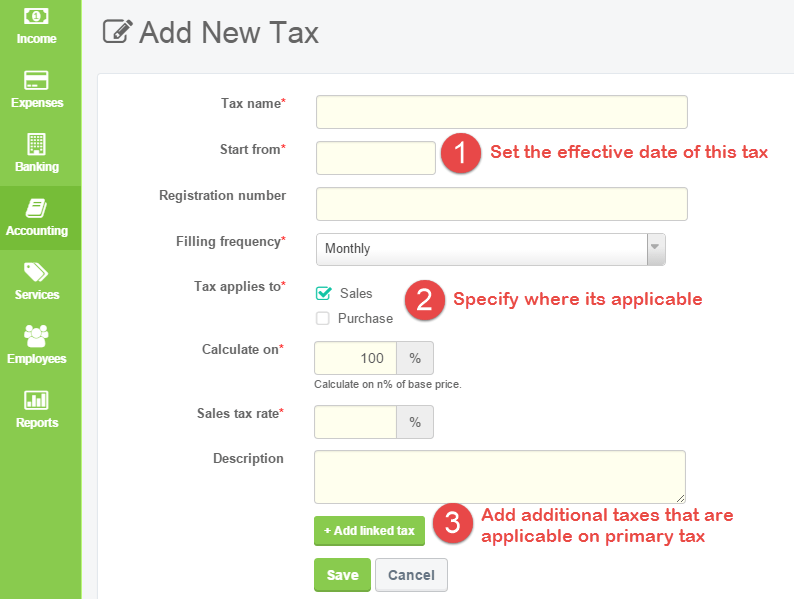 You can select both the options and system will create a separate tax code for Sales and Purchases. If you select only ‘Sales’, this tax will appear only on invoices and estimates. Similarly, if you select ‘Purchases’, tax will appear on Purchases and POs. You can also specify whether this tax is calculated on the entire amount or just part of it. In some cases, businesses need to apply tax only 80% of the base price. Leave it as 100% if this case doesn’t apply to your business. Click on ‘Add Linked Tax’ if there are additional taxes applicable on the primary tax. In some cases, you might want to add additional taxes that are part of the same tax group. Lets look at some scenarios to understand how values for additional taxes will be calculated. In ProfitBooks, you can mark tax as inactive instead of deleting it. This way association of that tax with old transactions is preserved. To do this, just click on the ‘Mark Inactive’ button on respective tax section when you open Taxes page. How to create professional invoices and get paid faster. How to manage business expenses.